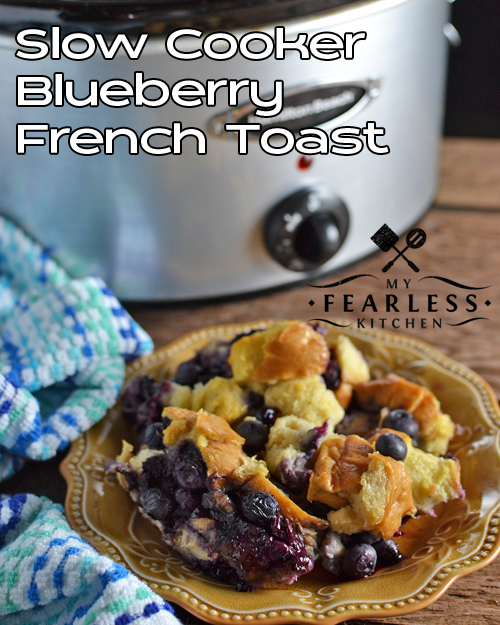 Are you looking for an easy, tasty, fruity French Toast recipe the whole family will love? 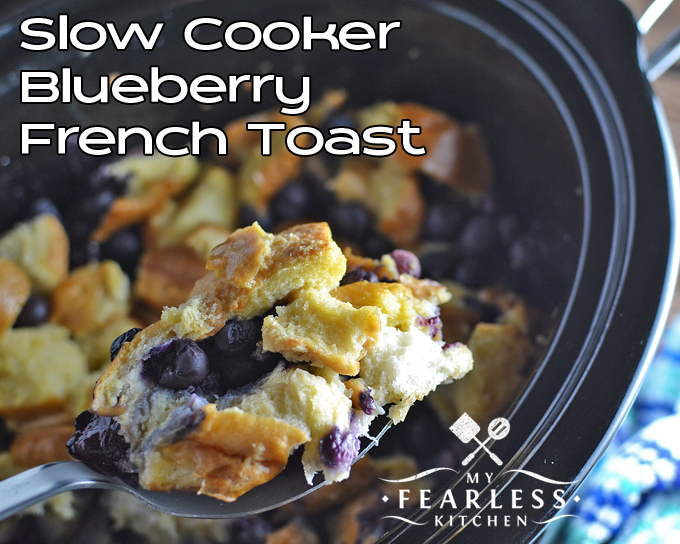 This Slow Cooker Blueberry French Toast is perfect! This recipe for Slow Cooker French Toast Casserole is one of our most popular recipes. We love to make it around here. It’s so easy to put together, and it tastes so yummy! I also love blueberries, and I wondered what would happen if I added blueberries to that French Toast recipe. Guys… it’s awesome! 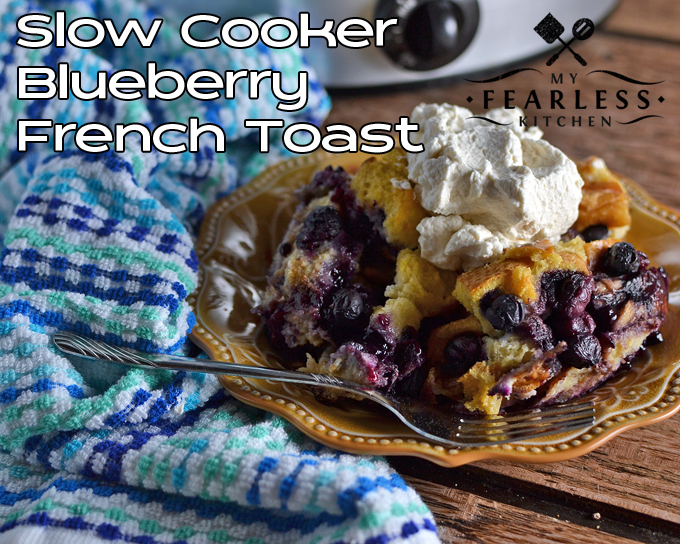 This Slow Cooker Blueberry French Toast is based off this Slow Cooker French Toast Casserole recipe in “Slow-Cooker Fall Favorites” by Gooseberry Patch. It’s not exactly the same recipe, but it’s pretty close. The original recipe called for the bread to soak in the egg mixture for a couple of hours in the refrigerator, but I skipped that step in this version, and it came out just delicious. So don’t worry about that prep step, breakfast just got faster! You will need a big slow cooker for this recipe – a whole loaf of French bread cubed up takes up a lot of room! I used this 6-quart slow cooker from Hamilton Beach. Absolutely do grease your slow cooker first, though…. just trust me. A baking spray like this one will be enough. It makes clean up so much easier! One other easy hack – place a thick layer of paper towels (I am a huge fan of Viva paper towels) on top of your slow cooker, under the lid. This will catch most of the condensation from the lid of your slow cooker, and keep it from dripping down onto your French toast. This simple trick will help keep your French toast from getting soggy! (I learned this handy trick from my friend Cris at Recipes That Crock. Check out this recipe for Crock Pot Hot Fudge Peanut Butter Cake from Recipes That Crock for another great recipe with this trick. If you really want a treat, make this Easy Homemade Whipped Cream to top your Slow Cooker Blueberry French Toast. Trust me, you’ll love it! I used fresh blueberries in my French toast. You could also use frozen berries. Just thaw them first. If you add them in frozen, it will add cooking time to your French toast, and the bread could get dried out. Cut French bread into 1-inch cubes. Place in a large bowl. In a medium bowl, combine eggs, milk, vanilla, and sugar. Mix to dissolve most of the sugar. Pour egg mixture over bread and mix well to coat bread. Lightly grease a 6-quart slow cooker. Spoon bread mixture into slow cooker. Cover, and cook on high for 2.5-3 hours. Let sit, uncovered, for 5 minutes before serving. « How is a GMO Made? This look so good and I am glad I can make it in my slow cooker! It is so tasty, I know you’ll love it! This looks absolutely divine! Thanks so much for linking up at Whatcha Crockin’ Wednesday!! That paper towel tip is the bomb!! WOWZA, it’s like brilliant!!! Can’t wait to make this next time I am serving a big breakfast. Hi, If I only want to make half the recipe, is it half the cooking time? This looks perfect for Christmas morning! Oh, I don’t know about cooking half the recipe. The trick to French toast in a slow cooker is getting the middle cooked, but not letting the edges burn. I would worry that the center wouldn’t get cooked through. It does make delicious leftovers if you decide to make the full recipe! Can we make this the night before and pop it into the slow cooker in the morning? Yes, you can! You might need a little longer cooking time.